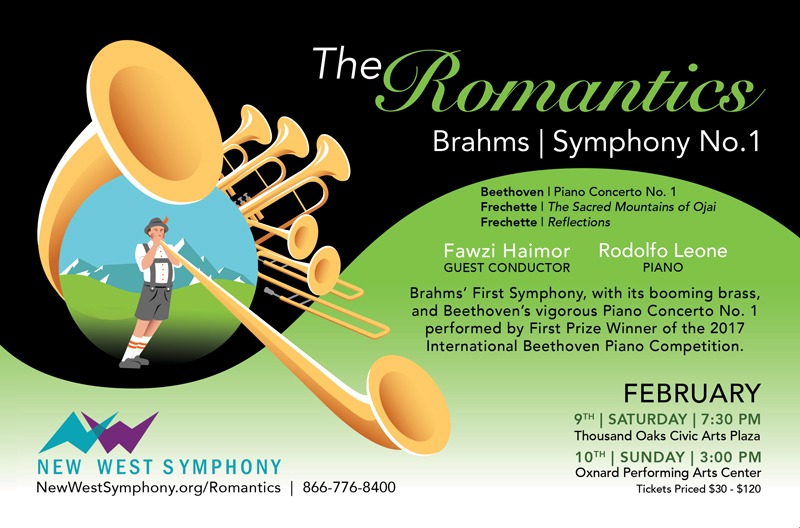 Treat your valentine to a magical night of Romantic classics with New West Symphony. Beethoven’s first piano concerto will bring you close, performed by Rodolfo Leone, winner of the 2017 International Beethoven Piano Competition. Brahms’ First Symphony, evoking idyllic music of shepherds, will make you fall in love. And world-premiere pieces by local composer Pauline Frechette, will warm your heart. Twenty-seven-year-old Italian born pianist Rodolfo Leone is the First Prize Winner of the 15th International Beethoven Piano Competition Vienna (2017). Described as “a true sound philosopher” (Oberösterreichische Nachrichten), Rodolfo released his debut album on the Austrian label Gramola in May 2018. The all-Beethoven disc features two pillars of the piano repertoire: the “Hammerklavier” Sonata and the “Waldstein” Sonata. His playing has been described as having “impeccable style” and “absolute technical control” with “hands that every pianist would like to have” (Il Nuovo Amico). Haimor was born in Chicago in 1983 and educated in the Middle East and in San Francisco. He completed his violin training at the Jacobs School of Music in Indiana University, and studied conducting under David Effron and Arthur Fagen. He earned bachelor’s degrees in both music and neurobiology, a master’s degree in conducting from the University of California-Davis, and second master’s in instrumental conducting at Indiana University. He was previously Assistant Conductor at Alabama Symphony Orchestra, where he was also the first Music Director of the Alabama Symphony Youth Orchestra. Until 2015, he was Assistant Conductor and Resident Conductor of the Pittsburgh Symphony Orchestra, where he led a variety of concerts including classical, pops and outreach. While in Pittsburgh, he also served as a cover to esteemed conductors including Manfred Honeck, Leonard Slatkin, Gianandrea Noseda, Rafael Frühbeck de Burgos and Yan Pascal Tortelier. Pauline Frechette, aka Raven Kane, is an accomplished musician/composer/performer. An award-winning singer/songwriter, Pauline has performed and recorded with many legendary artists including: Paul McCartney, Cher, Willie Nelson, Leonard Cohen, Diana Ross, duets with Neil Diamond, and with MUSE for the 2012 Olympics. She has performed on film scores including Rent and Aladdin. As a composer her work has been performed by the Goodspeed Opera House, The La Mirada Theatre for the Performing Arts, The Baltimore Symphony and the Hollywood Bowl Orchestra for 17,000 people. Her current album, Colors of My Heart, has over 4 million listeners. It debuted on the Billboard Top Ten Classical and jazz charts, is entered for a Grammy Award for Best Instrumental Composition and is being played in over 50 countries in stores and restaurants as well as on FM radio stations all over the world.